Adding a screen doesn't make the experience any better. Hailed as the next big thing a few years ago, virtual reality has yet to truly make its mark. Perhaps there'll never be one killer use for VR, and it'll remain a minor player in many niches: gaming, entertainment, education, therapy, enterprise, art and others. Some of the more unusual experimentations mix the virtual world with the real. VR roller coasters, for instance, blend physical movement with elaborate virtual settings to create a unique experience. 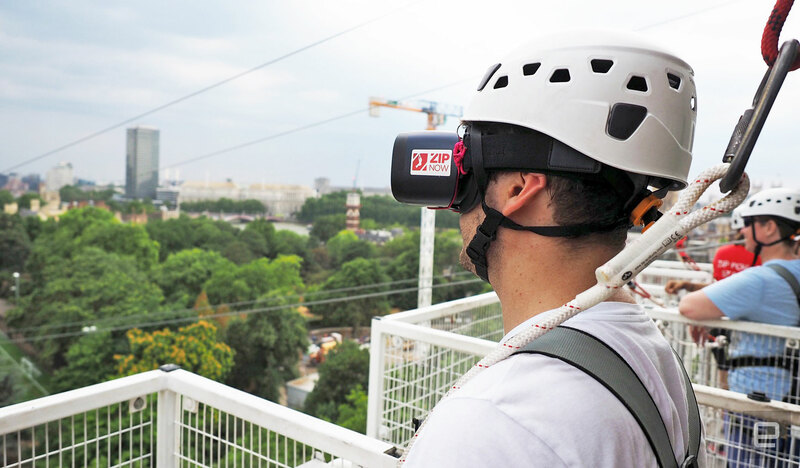 Zip Now in London is trying something similar: ziplining with a VR twist. 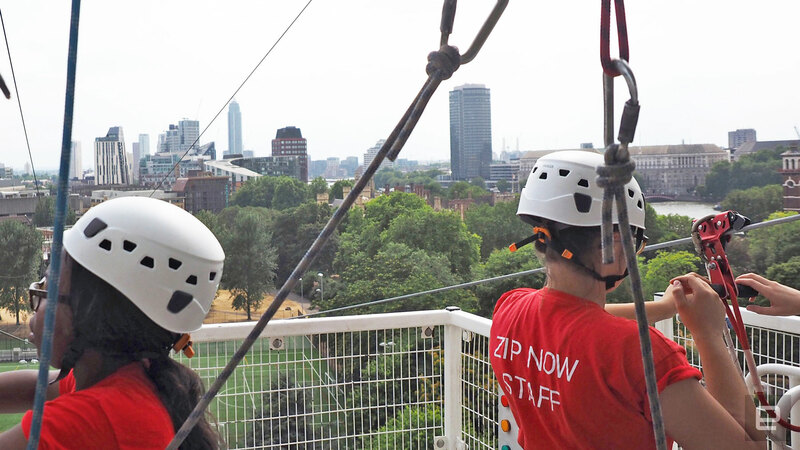 Based in Archbishop's Park, not far from the center of London, Zip Now is a temporary zipline, up and running until the end of summer. It's 225 meters long, starts 35 meters up, and riders can reach speeds of up to 50 kph (just over 30 mph). 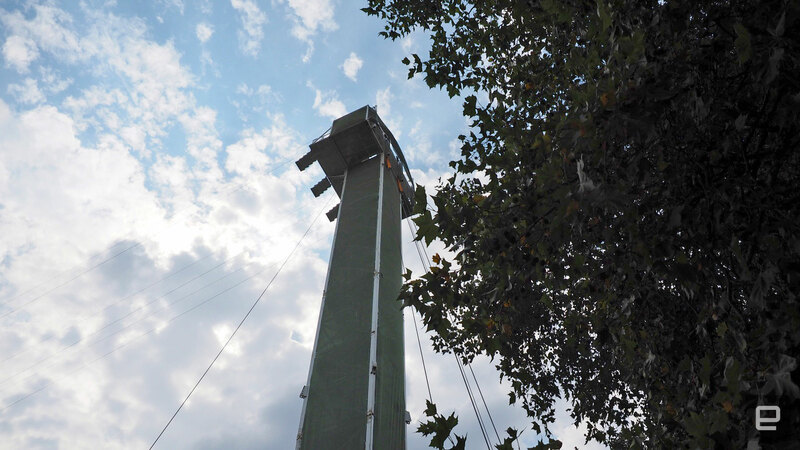 Once you've gone through the rigmarole of watching the safety video, getting into your harness and having it checked numerous times by different people, you can begin the climb to the starting platform. The next part is, in a word, unpleasant. You climb ten floors of metal steps and the spiral nature of the staircase is disorientating. It screams temporary structure, with rough welds and big bolts holding the 35m-tall tower together. At the top, you can feel it sway ever so slightly in the breeze. I'm not that afraid of heights, and all the Zip Now staff are incredibly safety conscious, but that didn't stop my brain from playing worst-case scenarios on repeat. The toughest part is descending the final set of steps that lead nowhere; they just end. You're all hooked up to the zipline at this point, of course. A few tentative steps down and you feel the harness tighten around you, supporting your weight. All is well. 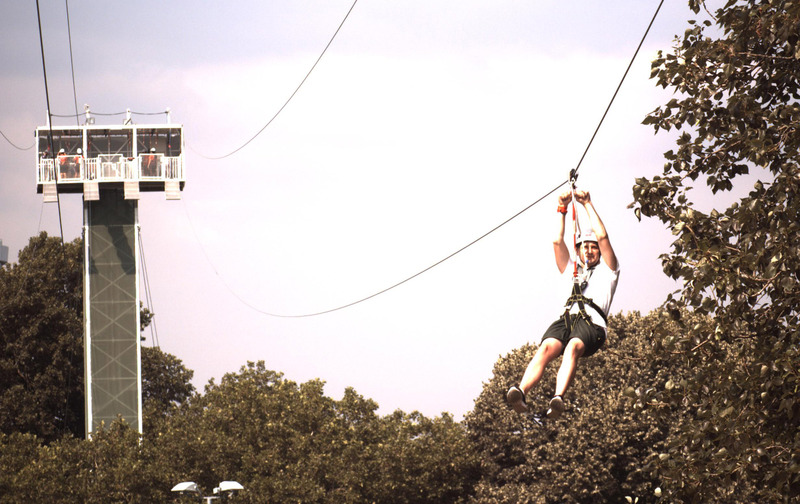 The zipline journey only lasts around 10 to 15 seconds, but it's fun enough until the abrupt, slightly jarring deceleration at the end. Not exactly an adrenaline-junkie's thrill ride, but you get to see some nice views of London and experience an abnormal sensation. Everyone that chooses the augmented reality package for £49 (around $64) does their first ride raw. This is to ensure you're familiar with the general procedure, so you have a point of comparison when you do some of it with a Gear VR strapped to your face the second time. The use of the phrase "augmented reality" here is a strange one. It's not really AR, but nor is it strictly a VR experience. I was told this was the best descriptor Zip Now could think of, though everyone knows it's not entirely accurate. When I reached the top of the starting platform for my second run, I was asked immediately to don the VR headset. Zip Now does this so you can get adjusted and have the helmet on again before getting anywhere near the wire. I was glad of it. No more thinking about the swaying tower or general exposure of it all. I was chilling in an expansive virtual living room in the style of supervillain meets banker. The rest is quite a labor-intensive process. It takes two members of staff to guide you into position, get you hooked up to the zipline and ready to ride, harness taut. Also rather clunky is having to press play on the 360-degree video you watch during the run, wait for the countdown and go. The video was filmed on the Jebel Jais zipline in Ras Al Khaimah, United Arab Emirates. It's the longest zipline in the world at 2.8km (more than 1.7 miles), taking around a minute and a half to travel. The video you watch on the London zipline isn't nearly that length, of course. In reality, it's just the opening few seconds of the Jebel Jais run stitched roughly to the last. It's a bizarre experience for many reasons. 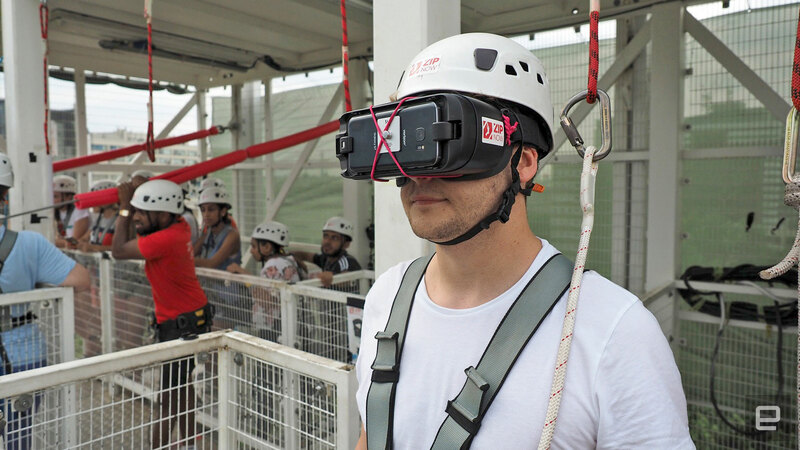 With the VR headset on, you barely get the sensation you're ziplining at all. I could be a few feet from the ground for all I know; the wind I feel could be coming from a fan. With the headset on, you're disconnected from what's actually happening. Then there's the video. Spinning around on the harness, I'm taking in the views of the relatively barren Ras Al Khaimah mountain range. It's not that interesting and much lower fidelity than real life. I can see the weights above me, which were necessary to get the 360-degree camera rig traveling down the line at an appropriate speed. The stitch between opening and ending clips is immediate and obvious. There's no "reality" about it. I was told Zip Now is thinking about making the process a bit more seamless, perhaps creating a bespoke app that syncs the video to the London zipline without the user needing to play it manually. In my opinion, Zip Now has missed a trick. An entirely custom and outlandish scenario -- like flying through a raging space battle -- would be better suited here. The linear direction of travel and the short duration of the run means it's much less disorientating than a lengthier VR roller coaster can be. Why not use that to your advantage and take the rider on a bite-sized, altogether alien journey? Then again, there's a promotional aspect to the experience that's not lost on me. In some ways, it feels like you're living an ad for a longer, better zipline. And that's perhaps a tad cheeky given you've paid to consume it. There are worse ways to spend 15 seconds of your time, but there are also better ways to spend your money. A single adult ticket on Zip Now London is £26.50 (nearly $35), so you're paying nearly that much again for a second ride that's less exhilarating than the first. As it stands, the truth is you're watching a less-detailed-than-life video of a different zipline... while ziplining. There's limited value in that. Still, the world's first augmented zipline is just something a bit different, and if companies don't play around with bizarre, unique applications of VR, then we'll never know which weird experiences make sense, and which don't.